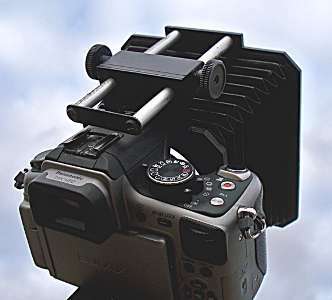 What kind of matte box solution have you got for situations when your GH2 is on a steadicam stabilizer? When using a camera stabiliser (steadicam, glidecam etc) it's very unlikely that you are going to put the whole rig on with rod holder, rods, FF, MB etc --that's just too heavy, unless, of course, you have a steadicam vest - and most people here don't. Plus, there is the practical irrelevance of using a FF while the camera is on a stedicam (unless of course, you have a separate focus puller person who is using a remotely operated FF - most people here don't). So the solution is often to take your naked GH2 and place it on the steadicam just as it is. The problem then are the flares. So I thought of getting one of those rubber lens shades that can be easily stuck to the lens, but the problem with those is that they are not always catered for wide angle lenses. My question: have you ever seen a rubber lens shade that could be attached directly to the lens, but at the same time have collapsible increments like this? A no-brainer: Cavision 3 inch. I've tried Cavision products and find that they don't stand up, but I haven't trired the one mentioned above so I don't know. After an exhaustive search, I found a 4x4 light weight MB that clips on and won't vignette right right down to 11mm. It's made by Vocas, and comes with a french flag and eyebrows. -- was actually made for DV use, so can be found cheap now -- $500. PM me if you want the contact for the rep in Canada who was clearing them out. I think he had a handful left. Very happy with it.